I agree with Mr. Yanase’s activities from the heart. 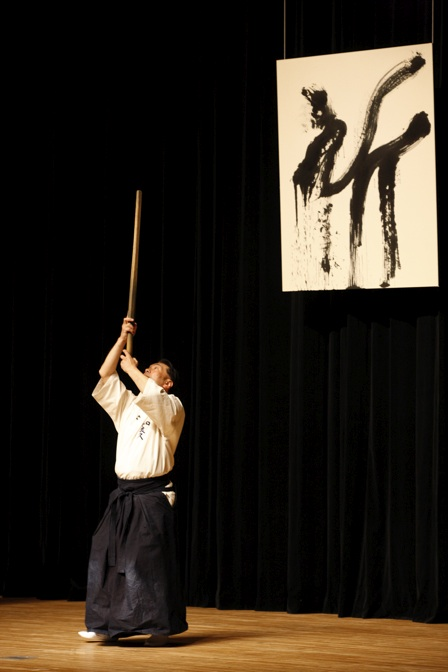 Waraku regards the essence of sword as festival. It is pure and simple; there’s no above nor below; there’s no right nor left. It is to return to the middle. Kotodama (the spirit of word) also plays an important role in festivals. The spirit of word is the power of god given to all living beings on the earth. The power of god manifests by the power of word and it is hidden equally in everyone’s heart. When you realize the power and have faith in it, the seal of Kotodama is broken. This is called “Amano-Iwatobiraki”, the opening of the gate of the celestial rock. Miraculous power manifests when many people gather and pray. The power of prayer is like generating electricity. A drop of water may be of little power but when many drops of water gather and flood, it can generate electricity. When we put our hearts together and concentrate over time and place, we are united as one and it creates an electric field and emit light. The power of human species is not small. When we detach ourselves from ego and cherish others, we start to produce amazing powers. Let’s bring our drops of water together and change it into a great power. Our practice today will be a festival.